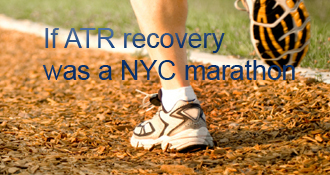 mrboro has completed the grueling 26.2 ATR miles to full recovery! On 10th March I played 5 a side football as I often tried to do on a weekend. It was about 10 minutes before the end of the game when I ran forward to pick up a loose ball. Nobody was near me and as I touched the ball, I felt a ‘twang’. I remember an excruciating pain as if I’d been shot in the back of the leg. I remember blackness around my peripheral vision and I stumbled to the floor. Immediately I feared that it was the Achilles. When I held my leg I expected the muscle to be coiled up my leg but it wasn’t. My teammates made me comfortable and a huddle gathered around me. The match was abandoned and an ambulance called. During this wait, the adrenalin kicked in and I did wonder if it was really as serious as I’d initially thought. Maybe it was a calf pull or something less severe? After a few minutes the paramedics arrived. I tried to call the wifey on a borrowed phone, but she wasn’t, answering. During this phase I’d been entirely motionless on my side in the sports hall. I remember looking at the paramedics when they looked at my leg, I just knew that it wasn’t a muscle pull but still hoped that it might be. I was transported into the ambulance and my wife and children arrived at the sports hall. They’d been alerted by a neighbour’s wife and rushed to see me. My youngest seemed unconcerned but my eldest seemed far more upset. They both climbed into the ambulance to have a look. We set off to St James and made small talk on the way. The pain was uncomfortable but bearable. As we got to A&E it was clear that Saturday evening was not the best time to come to hospital for a prompt visit. I was wheeled in and parked in the waiting area. After 30mins, I felt myself fading. I became hot and dizzy and felt nausea in my throat. I remember asking an able bodied fellow waiter if they could get me a sick bowl. By this point the adrenalin had worn off and the pain and shock meant I was feeling ready to keel over. The nurse came and I was immediately taken to a cubicle where I was put on a couch and made comfortable. It soon became obvious that it was a full rupture. The doc took one look and compared the damaged ankle to that of the good one. I was then x-rayed to ensure no bone damage and then plastered (lightweight cast) before been dispatched with painkillers with an appointment for the fracture clinic on Monday. The Sunday was very uncomfortable with soreness and getting used to the cast. Finally on the Monday (12th March) I was seen my Mr X at LGI and given the conservative or operative options. I opted for an operation for the lower re-rupture rate and it was booked for the following Monday (19th March) subject to ultrasound confirming the full rupture. It’s undoubtedly a scary thing to choose surgery as it can lead to infection and blood clots and it wasn’t chosen lightly. However, as much as it terrified me, I didn’t want to give up my sport so the re-rupture rates were a key deciding factor. During this visit I was replastered by a particularly rough nurse (’The Beast’) who managed to put her thumb into my damaged ankle, this served as a reminder that I had a serious injury….. The next week leading upto surgery was extremely painful. The cast rubbed and I simply could not get comfortable. If my leg wasn’t raised, it felt as if blood was surging into my foot and it was swelling up. Needless to say, my op was entirely reliant on the ultrasound and I didn’t hear anything for a few days so chased it. It became apparent that the ultrasound people did not realise their diagnosis was essential and didn’t realise the op was scheduled for Monday. They said they were full and I told them to find me a slot. Eventually they did. The key thing here is to never assume everything is ‘in hand’. On Friday, my foot was ultra sounded at Chapel Allerton and it was officially diagnosed as a complete rupture with a 1cm gap. At this point I had no idea exactly where the tear is in relation to my ankle, my understanding is that the further from the ankle spur the better, I really must find this out. During this week my new iPad was dispatched, this was to be fantastic timing and certainly made the weeks after the op a little less dull. My leg was constantly raised and I spent most of the time in bed with my dear wifey’s kind nursing. My medication involved paracetamol, ibuprofen and codeine. These seemed to take the edge off the pain but I was always very aware of the times when my next pills were due… Codeine seemed to be initially great as it give a warm pulsing, drowsy relief! On the Saturday night my wife suggested a takeaway curry to lift spirits. I jumped at this and, foolishly, decided to have a small bottle of beer and a small glass of wine with it. Big mistake. The Sunday before the op, I spent in bed all day throwing up. Let this be a lesson, codeine and alcohol does not mix. At one point we did wonder if the op was feasible for the next day but I couldn’t bear any further delays. When we got to Ward 50 at LGI, we were taken to a rather full adapted ward where a bay was been used as a waiting area. ‘Ermm’ I thought, ‘this doesn’t look good’. Sure enough I had a long wait whilst wife dispatched my eldest to school. This is where the NHS fails to understand that fasting and getting to hospital, especially with children, can cause mayhem. There was absolutely no need to have people waiting from this time. Eventually, I was taken into a bay directly opposite the waiting area (privacy and dignity?!!) and told to get cleaned up with a microbacterial wash in the WC! We ignored instructions and I managed to get into the shower and clean myself with wifey’s help as best we could. Finally at 11.30am, the trolley came to take me to theatre….. This was terrifying but the porter and nurse who accompanied me were friendly and chatted all the way. This was a classic NHS journey through lots of public corridors and lifts and it took quite a while to reach our destination. Eventually we reached the anesthetic room and the porter departed to be replaced by the anesthetist. Again, the manner of the nurse and anesthetist were really great. I explained how general anesthetics make me sick and I was promised they would try to avoid this. With cannula in, and drug administered, I was soon asleep. I woke up in a recovery room at around 2.30pm. The nurse was next to me and I think I blurted out something like ‘I remember you’ or something equally daft…. I remember reading the time and feeling dry mouthed but not sick. After the worry of the op, I actually felt a huge feeling of relief that my recovery could now actually start. Within 30mins or so I was taken to Ward 49 and put into a 6-bed bay. During this I was groggy but feeling pretty euphoric. My leg was in a ‘back slab’ plaster, which means old heavy plaster at the back and bandaged around the front. I was offered soup to try but asked for toast. Again, this was a mistake! You feel very dry mouthed after an op and the toast just felt like sawdust… I managed some but focused mainly on liquids. Fortunately my wifey arrived and opal fruits were bought which really helped for taste and sugar. In my bay we had a pretty disparate group. Opposite was an old chatty man who later revealed himself as a BNP supporter. Next to him was a very poorly old man who struggled with incontinence and next to him was a brash, arrogant, sweary young man. Next to me was a nice friendly chap. There is absolutely no privacy or dignity in hospital. The intention at this stage was to be discharged the next morning but I was desperate to escape as soon as possible. Around 4pm, I managed to make a deal with the nurse that I could go that evening if I could eat tea and could do a wee. She promised to get my drugs and discharge arranged if I could sign the ‘Wee/Tea Accord’. Once the drugs reduced slightly, my feeling returned and I was able to produce the goods into the cardboard wee bottles. The key thing here is to have lots of liquid and patience. I even managed to eat a bit of the NHS food which was pretty rank. As evening arrived so did my family and we waited for the green light to go. Needless to say, my drugs weren’t ready and they wanted me to stay over night as the pharmacist had gone home…. I suggested that drugs could be collected tomorrow morning if they had 12hrs supply for me now! This was agreed and I had to inject myself in front of the nurse to ensure I knew what to do to avoid blood clots. This actually was nowhere near as bad as I thought which is just as well as I’ll be doing this for 6 weeks! I was sent home with paracetamol, ibuprofen and diahydrocodiene plus injections for 12hrs. By 9pm, I was home, sore but happy!! The drugs from hospital had left my body and the pain over the next 6 days was quite nasty. I could tell exactly when my drugs were wearing off and the next ones due as the soreness increased. On day 3 the heavy plaster ‘back slab’ cast really began to rub and I was advised to return to hospital to get the wound checked. Fortunately, nothing was amiss but the experience gave me the chance to see my wound as the doctor inspected it. My foot was swollen and bruised and my own research had warned me of what to expect. The scar was about 6 inches long with relatively neat stitches along its length. After the all clear, I was put into the far lighter fibre glass cast and sent home for a further uncomfortable 3 days. Around 5 days after the op, it became apparent that the diahydrocodeine was making me feel sick and dizzy. This was probably the lowest point. It was obvious that I had to drop this tablet, once dropped the nausea and dizzy soon passed. Finally on Monday 25th March, things started to feel better, my pain reduced and I began to sleep deeper. The next few days passed without much incident as I became more agile on my crutches. Wifey managed to source a wheelchair from the Red Cross (in return for a £20 deposit, and we’ll give them a donation). This means that I’m finally able to look forward to a trip outside this weekend! My stitches will be removed on 2nd April and I’m planning to return to work on 3rd March as a homeworker. Hopefully the next stage will be the removal of the cast and the move onto the famous boot…. Still not clear about ‘what happens next’. As much as I want to move onto the boot, I fear that I may have more weeks in the cast. Hopefully I’ll find out tomorrow…. I’m really looking forward to having a few precious minutes without my cast tomorrow. Even if it’s just a cast change, 10 mins with cool air around my leg will feel fantastic! As for the removal of the stitches, not so keen….. Went back to hospital to get the stitches removed. Imagine my horror when my nurse turned out to be ‘The Beast’ (see days 2 to 3). Despite my reservations about stitches and the nurse, it was actually fine. It felt like pin-pricks and is definitely a case that the thought of it far outweighs any pain. My foot still looked swollen and black around the heel but it was nice to feel air…. A brief visit from the consultant condemned me to another cast with the carrot of a boot in 2 weeks time. After white, red and purple, I’m now sporting a green cast. Wifey is really keen that I wait before returning to work. Looks like that’s what I’ll be doing. Hope you’re in the boot fairly soon though. All best. Second surgery progressing. Stitches out today, no infection, healed and looks good. Back in boot 24/7 and still no weight on foot but I am thankful for the smallest progress. I even managed shopping at Wal-Mart on knee scooter only there a little while but first time in a while since I have been in a store. Oh by the way. Norm, I’m the same age as you. After playing Rugby for 25 years, sqush for 15 and keeping fit generally, the ‘mental’ side of an ATR has been the most difficult part: without saying, yours particularly, and other posters positive remarks have helped considerably. Thank You. Anyone else out there with a similar recommendation on a rare failed healing process ? P.s. 40 degrees (C) and sunny here today, not much chance of ice covered steps in Dubai ! Roger G, good to hear from you. Alas, I’m still willing to bet against the outcome we’re all hoping for. I do agree with the comment about the timing, though there’s something to be said for getting ‘er done and behind you. Also, while you’re AT-impaired, you should be able to use my “trick” to get down the stairs “normally”. I’ve posted it ~20 times, including on a fairly recent blog page of my own. Short version: plant your “bad” foot, pointing straight ahead”, about half-way on/off the step, toes over air. Then as you step past it with the “good” foot, next stair down, let the “bad” one roll over the nose of the step. As long as you’re careful and consistent in your foot placement, and not walking on ice-covered steps, you should look and feel pretty normal, even with zero df rom and very little pf/AT/calf strength. Works in a fixed or hinged boot, and in shoes. Quite a time since I’ve posted; all after my unsuccessful conservative treatment. Your advice at the time, after 9 weeks in caste/orthoboot and still 5 cm gap (!) was to go for.the op. my orthopod and physio thinks that I can manage without the knife. Apparently I have a very strong Plantar tendon, which together with scar tissue will hold it all together. Three weeks out of boot! I am walking with a slight limp and have two weeks in Dubai, so aqua exercise in pool could prove them right or wrong ! The only problem I have on mobility is descending stairs, which are a sort of sideways effort, but getting better. I also have swelling, particularly front of ankle which I ice to good effect. My orthopod, a specialist knee and ankle man says that time scale for op is now irrelevant; so if I want the op, say next year (when I have less pressing time issues) it makes no difference now. This is the second time I’ve heard someone say their doctor suggested a non-op approach on a “stale” ATR. I’m trying to see the logic in this, or if there is any. Do you think it’s possible that they’re hoping for a partial heal of the tendon that will ultimately lead to a fuller regeneration? I’m wondering if the tendon regenerates continuously long after the ATR. So perhaps they’re hoping that two parts of the broken ends can connect, and over time and use, the gap will continue to fill in. Is the tendon something that perpetually breaks down and recreates itself? For example, lets say a person has a less than ideal tendon healing at 8 weeks in the boot. However it is connected and they pass the thompson test. Will the actual quality of the connection continue to improve over the long term? Or is the quality of the healing pretty much set forever once it’s healed? BTW, I’m shocked that some doctors still try the non-op approach on totally “stale” ATRs, like yours after 18 months! Even 3 or 4 weeks after and ATR, I’d bet against any non-op treatment succeeding, because the window of opportunity has closed. I.e., the time of rapid and massive inflammation and healing and regeneration has passed. The trauma of surgery — having all the tissues, including the ends of the torn AT, cut with a scalpel — starts the clock running again, and opens that window. I am a HUGE fan of non-op treatment of fresh ATRs, based on the excellent results from recent studies using fast, aggressive, and convenient protocols (like bit.ly/UWOProtocol from Canada). But slapping somebody in a boot who’s got an 18-month-old ATR is just a dumb waste of time, IMHO, no matter the age of the patient. marltom, I’m the same age as you, so you’re young enough to become an addict here — watch out!! Lots of people who blog here have never done it before. I’d expect the results of your second surgery to be as good as your first, and — we all hope! — longer-lasting. Sorry about that, marltom! I don’t remember your prior details, sorry. Do you have a blog of your own? If not and you’ve got some time and energy, start one, and catch us all up (again). If you had screws, then I guess it was either to fix a Haglunds-type problem, or to reattach an AT that had pulled off the heel bone. Bummer about the screw. When things go well, nature’s healing is a miracle, but when your body starts doing the healing around a loose screw, it’s not what you need. Your successful rehab and PT last time will probably stand you in good stead this time, too — less atrophy, good attitude, you know what to expect and how to Watch Your Step, etc. Good luck! Just had to have a second surgery mon. It was suppose to be minor, clean out the small wound that has not healed for any length of time during the past 21 weeks since surgery. When the Dr. got in there he found a screw lose, lots of scar tissue. He ended up opening the whole scar. I am back completely off my foot for at least 4 weeks. I had been doing so great, doing wonderful in PT . I was able to wear 2 shoes and climb stairs. This is such a set back.. Sorry to hear you are having problems, I am now almost 2 years post op and had a similar problem to yours which required additional surgery. I took high dose Antibiotics for 6 weeks to no avail. The reason was that while the infection was being killed off, the suture kept poking back thru the skin. When the surgeon snips the suture if he cuts it at an angle then this creates a point which inventually finds its way to the surface leaving a route for infection. The only way to cure this is to have the suture removed. After my op which took about 5 minutes the wound was packed with wadding and dressed on a daily basis for about three weeks. I then had no further problems and went on to make a good recovery. Hope this helps and you are soon on the way to a good outcome. Similar case to yours…I’m 11 months post op and I still cannot do a decent/full single heel raise. However, I can do many in the swimming pool, and I do notice some progress, albeit very slow. I also had wound healing issues, but they resolved much earlier and well before I went to two shoes. About weight training, I went back to doing legs at 5 months post op. I was in excellent shape at the time of my injury which helped. However, I am not back to the level I was before the ATR though getting stronger as time goes by. Like you, I tore my left Achilles, so the overuse on the right leg has brought me a serious case of tendinopathy, some pain in my right knee, and a lot of pain in my right Achilles. For this reason I have modified my calf workout. I only use weights on the operated tendon, and I go for high reps. No weights, only eccentric contractions with body weight on the other tendon. A strong calf muscle pulls harder and could rip a weakened tendon…Last thing we need is another rupture! 9 mo out of surgery. I’ve had many problems with my incision site. I live in the desert it is very dry. Like skin on a knuckle, when I started weight bearing my incision came open and 3 different spots. The top half has healed nicely and so has the bottom couple of inches. But there is a region about 3 1/2 in in the middle that had the hardest time healing. I’ve seen my ortho, primary, and even a plastic surgeon. None thought it was infected. It didn’t hurt too bad. My primary doc shot me up with some antibiotic which seemed to help. Still can’t do a single leg calf raise at this time despite 2 mo. of weight training (mostly leg). Started very small and am now almost back to my full strength in squat, leg press, and leg curl etc. The calf exercises I take very slow and and having problems with the single leg calf raise. I feel like my foot isn’t strong enough to get it off the ground but maybe a 1/4 inch. Thanks gkraemer14, hope your recovery is going a bit smoother then mine!! Hey Boro, You and I are on a very similar timeline. My wound started spitting out sutures pretty early, around 5-6 weeks. Sorry to hear that you’re having trouble. Hope everything gets taken care of. Hi Sheena, thanks for your comments. Hopefully the infection will be cleared by the antibiotics. If this happens, my op will be relatively minor to snip the suture back. It’s an open suture which is connecting the tendon, hence it can’t be taken out only snipped back so it’s ‘under the skin’. If the infection can’t be cleared or is under my wound, I’m looking at more extensive surgery. Oh No what a nightmare! Do your docs think there is any chance that the infection will go just with the antibiotics? I really hope it does, the thought of going through it all again is grim. Is there any way at all you can avoid surgery again, if there is a slim chance, personally I would push for that. what about IV antibiotics? If the suture has come out of the wound or is it still partially in there? Houseman - thanks for your comments. I believe I had my tendon stitched without any augmented tendon. It’s an interesting thought and I need to check this to make sure! Did you get your tendon augmented with the plantaris tendon? If yes, this will cause some soreness and irritation as the augmented tendon will have show some “lumpiness” and will rub against regular shoes. Kenstar 2 - Thanks for your comments, much appreciated. It confirms my suspicions. I think I need to get it checked as soon as possible. …. Thanks for your comments jeniferanderson, beralic and starshep! I’m trying really hard to avoid any sideways motion and keeping to very short (flat footed) forward steps. I started PT about 2 weeks ago, my foot movement downwards is ok but I can only get to around 90 degrees on my up movement. It’ll be a while until I’m pushing off properly!!! Starshep, I think your PT is doing a good job from what you’ve said. Mine is less strict but follows the same principles. Congratulations! The 1st bit is the hardest and a lot of it is about “the mental game” yeah it feels scary, but pain will guide you, don’t try and go too fast and you will be fine, it takes quite a while to be able to “push off” at the end of the stride, try to walk “normally” though without turning the foot out to the side too much, just take lots of shorter steps good luck! Congrats!! I started taking my first steps on Monday. Very scary, isn’t it? Keep at it and watch your step! I experienced no pain from the actual walking but my foot still feels tight across the top of the ankle and the actual wound is a bit sore/sensitive from rubbing from the walker boot and trainers. My major issue is the mental side of putting full weight on my foot. I’m not ‘pushing off’ from my toes yet to ensure my achilles isn’t under undue pressure until I’ve built it up a bit. My walk was a bit flat footed like a babies! Congrats! Did it hurt at all at PWB or FWB? DJ, it’s not hard to walk in a hinged boot that’s locked in a plantar-flexed (toe-down) angle, either. Fiberglass “walking casts” are also similarly toe-down, and made for walking. It’s often better with a “cast shoe” to add a rubber sole, and a similar gizmo on the other foot to equalize the height. If you’re “hobbling around” without crutches, then you’re not doing PWB or 25#, you’re doing FWB. And if your “hobbling around” (with or without crutches) is a toes-to-the-side hobble, then you should stop before you hurt yourself — probably not your AT, “just” the rest of your body! Ortho boots and walking casts are all designed so you can walk on them with your toes pointed straight ahead. Land on the heel, then roll straight forward over the gizmo on the rounded sole. As you move forward, the load that your AT-and-calf would normally bear, is borne by the gizmo and transferred to the front of your shin. For PWB, that’s only a fraction of your weight, the rest taken by the crutches; for FWB, it’s all of it, no crutches. DJ - ha - yes that is the question - how do you know when it’s 25#. He told me to practice with a scale to see what it feels like. I didn’t do that but just tried to only put a small amount of weight on the leg at first while using 2 crutches, and then very gradually increasing it over the past weeks. I haven’t done too much to work the foot yet, other then wiggling it a bit when the boot is off. My next appt. is on Tuesday - I assume I’ll be sent for PT after that. My calf is smaller, but not horribly so. What I’m really looking forward to is being able to drive again (I have a right ATR). How do you regulate 25# of weight bearing? I just hobble around with my boot on. I have been doing circle with my foot with the boot off since week 3 and also flexing my calf muscles. The gym this long is 15 years. Well, speaking from my experience - I am at week 7 as of Tuesday, non-op. After 4 weeks in a cast plantar flexed, my doc put me in a fixed boot at neutral, PWB at 25 pounds of WB. I’ve been gradually increasing the weight on my bad leg in teh past 2 weeks, and in the past few days am only using one crutch (and the boot at neutral). So it seems like you might be able to go to neutral? I will say that my tendon was sore the first day I was put in neutral, but it’s been fine since then. I think he means what I meant about walking. If their in the Don Joy boot the foot would be angled down locked so impossible to walk. If it is the other boot thats flat with heal lifts in it but the boots flat = able to walk. I will hit week 8 this Friday non-op. been weight bearing PWB since week 3 and pretty much Hobbling around the last 2 weeks fwb sometimes crutcjes alot of times not. My Boot was at 15 now 7.5 the past week. The doc and I don’t see eye to eye and I want to go to neutral this week. Anyone anyone??? He wants me to wait until week 10. Then stay in a boot until weeks 12-14. Julias, your “My foot in the cast is past 90 degrees, so can’t bear weight even if I want to” does not compute. The UWO study patients started WB at 2 weeks, while they still had 2cm of heel lifts in their AirCast (fixed, neutral) boots. Then FWB at 4 weeks, and the heel lifts stayed in until 6 weeks. Many of us have started WB and walking before we got our ankles to neutral. It’s not a fully natural walking gait, of course, but walking in an orthotic boot usually isn’t. Building the other foot/shoe up to the same height as the boot makes it much more natural — and safer for the rest of your body, too. Happy healing to you, too. I’ll see what happens with the crutches. Thanks for your comments Julius! I’m very much still at the crutches stage (just over 6 weeks post op). I can hardly imagine walking at the moment. My ankle is swollen and I’m just getting a very small amount of movement. My Physio starts on Monday so I hope things start to improve soon. Good luck with your recovery! Glad to hear the comments about the boot. I get mine next week. I’ve been in a cast for 3 weeks after being in a splint for 2. So I’ll be 6 weeks post op by the time I start weight bearing. Very scary to start walking again, but I’ve almost fallen a few times on the crutches so at least that fear of falling and re-tearing will be gone. My foot in the cast is past 90 degrees, so can’t bear weight even if I want to. How soon have others been able to ditch the crutches? Janus! That’s a very amusing thought….. I’m sure all the Velcro on the boot can be used to good effect! I took it off at night. If you toss and turn a lot in your sleep, then maybe leave it on. But I think you’d be okay. Not likely to overload the healing ankle/tendon in bed — unless you and a partner are trying kama sutra variations, in which case all bets are off and the boot although a hinderance might even be required. mrboro’s AchillesBlog is proudly powered by WordPress and WPDesigner..